Requirements were INTRODUCED as a new merit badge effective May 18, 2015. This Merit Badge is a NEW merit badge. In your own words, describe to your counselor what animation is. Discuss with your counselor a brief history of animation. Plan your animation using thumbnail sketches and/or layout drawings. Share your animations with your counselor. Explain how you created each one, and discuss any improvements that could be made. Tour an animation studio or a business where animation is used, either in person, via video, or via the Internet. Share what you have learned with your counselor. Discuss with your counselor how animation might be used in the future to make your life more enjoyable and productive. Learn about three career opportunities in animation. Pick one and find out about the education, training, and experience required for this profession. Discuss your findings with your counselor. Explain why this profession might interest you. 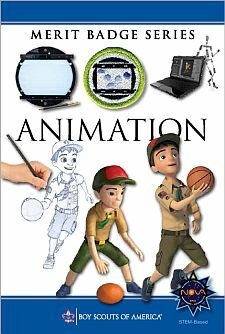 *The Animation merit badge will be introduced sometime in first quarter 2015. The supporting pamphlet will be available at that time. Scouts could NOT earn the badge until the official EARN DATE, which was May 18, 2015.